Breakthroughs in the cognitive and neurosciences give some idea why our results seem inconsistent with our intentions. Bias is natural to the human mind, a survival mechanism that is fundamental to our identity. And overwhelmingly, it is unconscious. Incorporating anecdotes from today’s headlines alongside case studies from over 30 years as a nationally prominent diversity consultant, Ross helps readers understand how unconscious bias impacts our day-to-day lives and particularly our daily work lives. 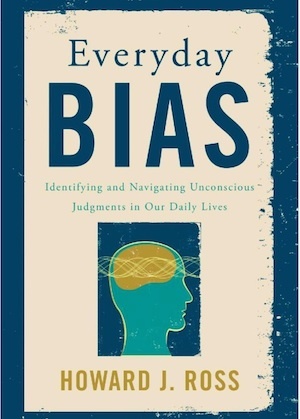 Additionally, Everyday Bias answers the question: “Is there anything we can do about it?” by providing examples of behaviors the reader can engage in to disengage the impact of their own biases. With an added appendix that includes lessons for handling conflict and bias in the workplace, this book offers an invaluable resource for a broad audience, from individuals seeking to understand and confront their own biases to human resource professionals and business leaders determined to create more bias-conscious organizations in the belief that productivity, personal happiness, and social growth are possible if we first understand the widespread and powerful nature of the biases we don’t realize we have. Achieving true diversity in organizations has been a common organizational goal for more than a quarter century, yet companies struggle to create an inclusive workplace. In “ReInventing Diversity”, Howard Ross, one of America’s leading diversity experts, explains why most diversity programs fail – and how we can make them work. In this inspiring guide, Ross presents interviews, personal stories, statistics, and case studies that show that there is no quick fix, and no easy answer. Acceptance needs to become part of the culture of an organization, not just a mandated attitude, for people to not feel alienated because of their race, language, gender, sexuality, ethnicity, or culture. Many prejudices are unconscious, and exclusions are often unintentional. Only through challenging our own preconceived notions about diversity can we build a productive and collaborative work environment in which all people thrive.